RECONCILIATION - CONFESSIONS-PENANCE: Saturdays: 3:15 to 4:00 p.m.
EUCHARIST: The Eucharist is celebrated during all of our Masses. Please refer to our Home Page for Mass Schedules. SACRAMENT OF THE SICK: Is available by appointment with Father. If you or a loved one desire the Sacrament of the Sick please call the Parish Office at 203-377-4863. CONFIRMATION: Is administered through the Faith Formation Program. R.C.I.A. 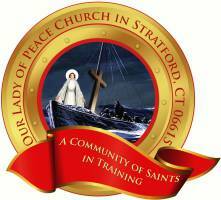 : Adults interested in becoming members of the Catholic Church and those who wish to receive the Sacraments of Baptism, First Eucharist, and Confirmation are asked to contact the Parish Office. MATRIMONY: Arrangements must be made with the Pastor at least (8) eight months in advance of the date. Before social plans are made.